Join us for our Route Setting Clinic. This week we will be teaching you the ins and outs of setting climbing routes on our indoor climbing wall. 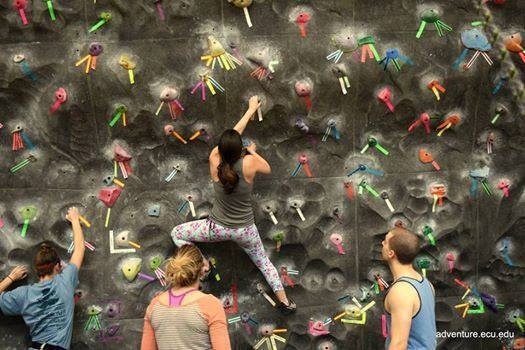 During this clinic, you will learn what goes into making our wall a fun and safe climbing experience and even have a chance to create a new route to add to our collection. Participants do not need any prior route setting experience just an eagerness to learn something new. This Clinic will be from 8-10 p.m. at the Climbing Wall at the back of the Recreation and Wellness Center. You must be a member of the ECU Student Recreation Center in order to attend this event. If you are a member you are allowed to bring one guest per event. That guest does not have to be a member to ECU’s Student Recreation Center.